Applied Biosystems, an Applera Corp. business, and its joint venture partner, MDS Sciex, a division of MDS Inc., on May 30 unveiled the first automated system for better detection of food contaminants, such as pesticides, dyes, mold-related toxins, and chemical and antibiotic residues. According to the National Center for Infectious Diseases, an estimated 76 million Americans experience food-related illnesses each year. This new system addresses the urgent need for a more effective approach to food testing. As the first application in the new family of Cliquid Software for routine laboratory analysis, Cliquid Software for Food Testing increases the precision and comprehensiveness of food contaminant testing while also simplifying the process. 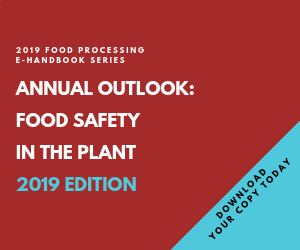 As a result, food producers, manufacturers and public health testing facilities in the highly regulated environment of food production and safety testing can more quickly and thoroughly identify a wider range of contaminants. Cliquid Software has been designed to bring point-and-click functionality to Applied Biosystems/MDS Sciex's high-performance LC/MS/MS (liquid chromatography/mass spectrometry/mass spectrometry) systems. One of several collaborators to help define the requirements for LC/MS/MS analysis in the food testing market was Dr. Philippe Guy of the Quality and Safety Assurance Department at the Nestle Research Center in Lausanne, Switzerland. The Nestle Research Center is among the global leaders in food research. "The Cliquid Software provides research facilities, like ours at Nestle, with the ability to deploy new validated methods, instrument tests and reporting requirements more easily to our regional laboratories," said Dr. Guy. "Indeed, with such a simple interface and workflow, laboratory personnel can adopt LC/MS/MS techniques and rapidly produce high quality standardized results. Applied Biosystems/MDS Sciex combined highly sensitive analytical tools with advanced software to create the new system, which is the industry's first commercially available automated food contaminant testing solution. Cliquid Software harnesses the power of Applied Biosystems/MDS Sciex's industry-leading mass spectrometers for advanced analytical capabilities. Mass spectrometry is a proven technology that offers extremely high levels of sensitivity by detecting the molecules in various substances. With the new system, Applied Biosystems/MDS Sciex is applying this technology to food testing through an easy-to-use software interface, delivering a custom-tailored solution to food companies and public health testing facilities without the need for extra resources or special training in mass spectrometry. With pre-configured testing methods and the flexibility to easily create and add new methods, Cliquid Software allows testing facilities of any size to develop systematic testing protocols. Results are captured in automatically-generated reports that can be customized to meet quality control, regulatory and laboratory requirements worldwide. "Applied Biosystems/MDS Sciex is responding to the persistent threat of food contamination by reshaping the food testing process," said Leonard Klevan, president for Applied Biosystems' Applied Markets division. "With Cliquid Software, routine testing no longer has to mean routine complexity." Cliquid Software for Food Testing will be available as a stand-alone software package or as part of a complete testing system that includes either Applied Biosystems/MDS Sciex's API 3200 or 3200 Q TRAP mass spectrometers, coupled with an HPLC (high performance liquid chromatography) system and starter kit, and installation and applications training. Cliquid Software for Food Testing is expected to be available in July 2006. Cliquid Software is being demonstrated at the 54th annual American Society of Mass Spectrometry (ASMS) conference in Seattle, May 28 through June 1. In the future, the Cliquid Software family is expected to expand to include additional routine analysis applications.